The sons love sub night. We have it at least once a month. They’re always putting their heads together to try and come up with new filling ideas and combos. We love hot or cold subs, but sometimes I just want to have an uber hearty, hot sandwich for my meal. This fit the bill perfectly. Literally, this giant twist on your average sub-sandwich is great. A quick & easy, ready-in-under-30-minutes meal, that’s every inch of sandwich perfection. Crisp on the outside, hearty and tender on the inside. I do love a good crunch to my bread. Both versions taste great, but if you get any ideas feel free to play around with your ingredients. Add in some extra veggies, change up the cheese. Heck, change up the meat. I seriously doubt you can go wrong with stuffed french bread. Mmm, can’t you just picture it? Smell it?? Go ahead, try it and taste the delicious-ness. 1. Slice the french bread in half, lengthwise, so you’re left with two equal pieces. Scoop out the bread in the center of each piece, making two bread ‘boats’. Place the extra bread in a large bowl and tear it into very tiny pieces. Trust me, you want them tiny. Place both halves of bread onto a large baking sheet and set it aside. 2. In a skillet over medium high heat, brown both the beef and the onion until fully cooked. Strain the grease and return to the skillet. Next, add in the celery and garlic. Cook until the celery is tender, about 2-3 minutes. Add in the soup, milk and Worcestershire sauce. Add salt and pepper, to taste. Cook another 5 minutes, or until the meat mix is heated through, stirring occasionally. 3. Add the meat to the bread in the bowl, stirring to combine. Pour mixture into the center of one half of the french bread and spread out evenly. Spread out evenly. Sprinkle the meat mixture with the cheddar cheese. Top with the other half of bread to make it a sandwich. 4. Bake at 350 degrees for 10-15 minutes, or until the cheese is melted. When done cooking, let your bread sit for 5 minutes so everything ‘sets’, before slicing and serving. Then, eat up! 2. In a skillet over medium high heat, brown both the beef and the onion until fully cooked. Strain the grease and return to the skillet. Next, add in the mushrooms and garlic. Cook until the mushrooms are tender, about 2-3 minutes. Add in the soup, milk and Worcestershire sauce. Add salt and pepper, to taste. Cook another 5 minutes, or until the meat mix is heated through, stirring occasionally. 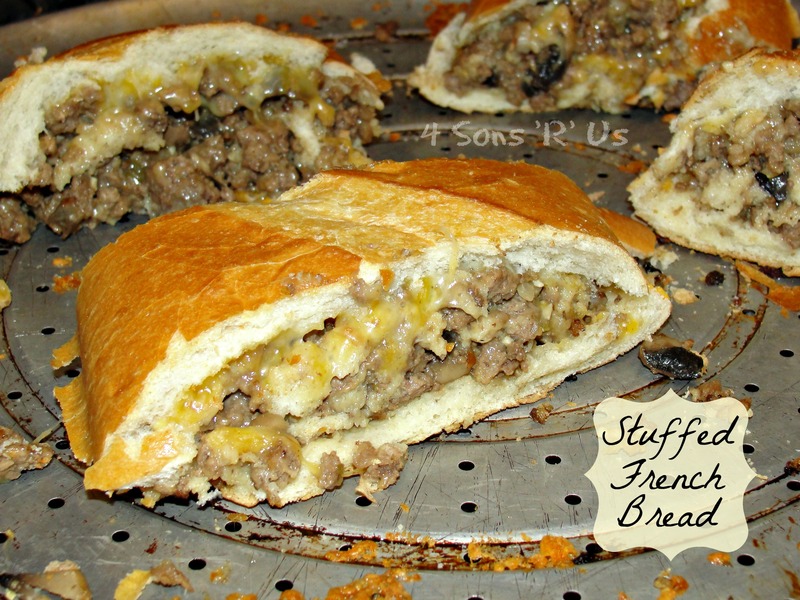 Stuffed French bread?! Yes please!! I love stuffed bread recipes, this looks amazing! This recipe has been featured at Tasty Tue a sday this week! Feel free to stop by and grab featured button, as well as link up some new recipes here! This looks so yummy..Definitely going to try it, but I think I’ll add the mushrooms & swiss cheese. My husband loves mushrooms.